Flower Express Flower of the Month!!!! 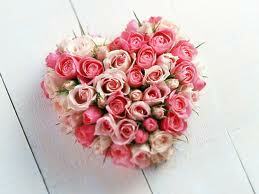 The word “Rose” means pink or red in many languages but comes in many different shades. 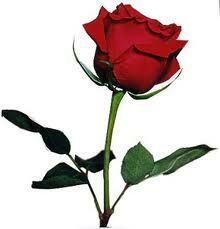 For the record, there is no true blue rose. If you see one it is dyed or painted which vastly shortens the life span. The red rose is used the most in the commercial floral industry as a sign of love for the busy Valentine’s holiday and year round. Different colors have different meanings. Red – Love, Beauty, & Romance. White – Purity, Innocence, & Remembrance. Yellow – Friendship & Joy. 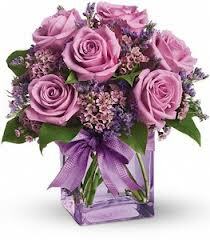 Pink – Dark shades – Gratitude & Appreciation, Light shades – Sweetness, Gentleness, & Admiration. 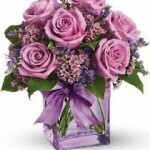 Lavender – Enchantment & Regal Majesty. Orange – Desire, Enthusiasm, & Passion. 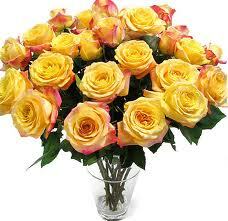 Ornamental roses have been cultivated for millennium as far back as 500BC in the Mediterranean. Many hybrids have been produced since then to produce a wide range of colors as well as petal count. Rose hips, the fruit of the plant, are a great source of vitamin C and can be made into jams and jellies. Rose water is used in Asian and Middle Eastern cuisine while rose syrup is used in French food and in the making of the marshmallow. An ancient symbol of love and beauty the rose was sacred to many goddess including Isis for the Egyptians, and Aphrodite and Venus for the Greek and Romans. In modern times it is often used to honor the Virgin Mary. The roses growing in the Garden of Eden were said to be white but turned red upon blushing in shame at Adam and Eve’s fall from grace. Perfect entry adornment for reception or ceremony. Available year round, roses are appropriate for any occasion. Looking for a specific shade? 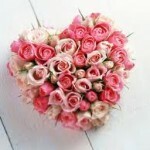 Check out our rose color index under the “wedding” tab for names. Call us at any of the three Flower Express locations to place your order today and keep an eye open for weekly specials using our Flower Of The Month! Previous post: Glad our glads are here! !